Creating project plans in the current versions of Suite is clunky and is inefficient. To create a project plan, you have to click 3 to 5 times to create 1 project task. This not only takes time, but does not allow a project manager to build large implementation plans and intuitively see the logical order of tasks in the system. Project Management is better when it’s visual and you can see what everyone on your team is working on in a single glance! 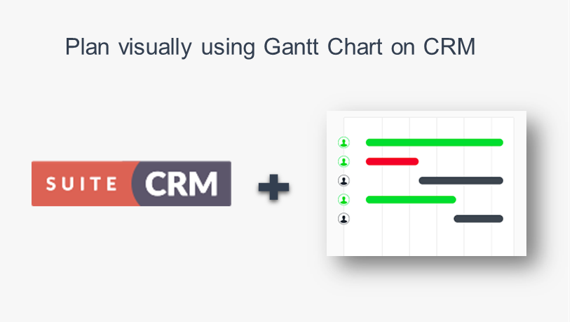 Gantt Chart Ninja gives you a graphical user interface that enables you to build your project plan right within SuiteCRM by providing an intuitive Project Plan and Gantt Chart layout. Creating a Project Plan and a project task is reduced to 1 click only. Changing dates associated to existing project tasks is done with a click and drag across a calendar timeline. This greatly increases the speed in creating project plans, and gives project stakeholders 1 place to view all project tasks and status. "A great enhancement to SuiteCRM's basic GANTT functionality. Great intuitive user interface. Easy to use and understand."